There's no need to go out for great Indian food. These vegetable samosas are super easy. And even if they aren't purely authentic (they're made with puff pastry to eliminate the need for making the dough), they are quite delicious! Garam masala is a combination of several spices: coriander, cumin, cloves, pepper, cardamom, cinnamon, and bay leaves. You can buy it in most large supermarkets or gourmet markets. Remove puff pastry from freezer and let it sit out at room temperature, about 40 minutes. Preheat oven to 400 degrees F.
Place potatoes in a medium saucepan. Cover completely with water. Bring to a boil, then reduce heat to medium low. Let simmer 10-15 minutes until fork tender. Heat oil in a large skillet over medium heat. Add onion and cook until softened, 4-5 minutes. Add peas and carrots, garam masala and curry powder to skillet. Cook 3-4 minutes. Add potatoes and salt. Cook, stirring, another 2-3 minutes until flavors meld. Remove from heat. Have a small bowl of water and a pastry brush next to your work surface. Cover a baking sheet with parchment paper or spray with cooking spray. On a lightly floured surface, unfold puff pastry. Cut into 9 equal rectangles. Place about 1 tablespoon of filling in the center of each rectangle. Dip the pastry brush in the water, and wet one long side and one short side of each rectangle. Fold over like a triangle to seal in filling. 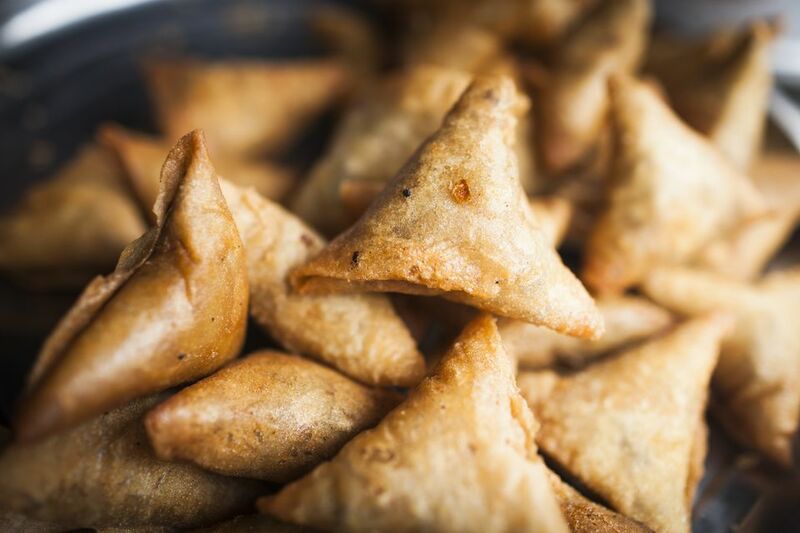 Place samosas on prepared baking sheet. Bake 15 to 20 minutes until golden brown.